Sabudana Vada also called ‘Sago Vada’. Sabudana Vada is a traditional deep fried snack from Maharashtra, India. 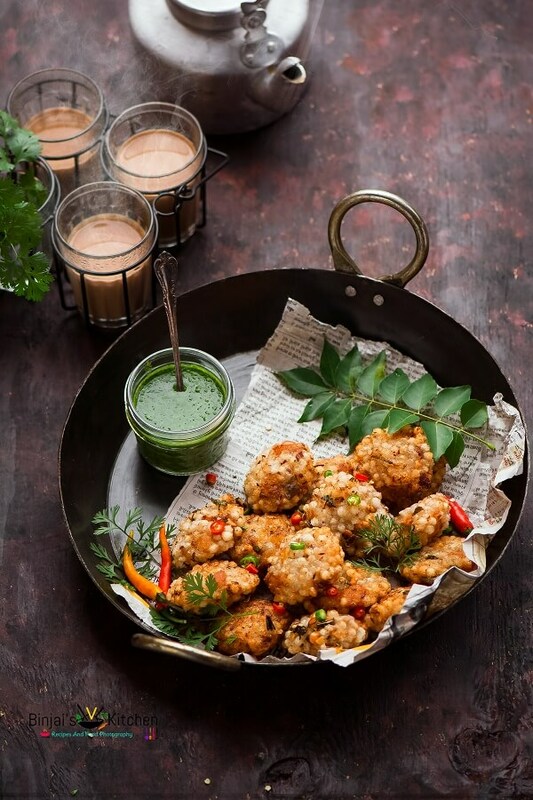 Sabudana Vada is often served with spicy green chutney and along with hot chai. In other parts of the country, Sabudana Vadas are the best option to have when fasting. Therefore, this filling and nutritious snack is served usually during religious festivals and during fast/vrat/upvas especially during Navratri vrat. 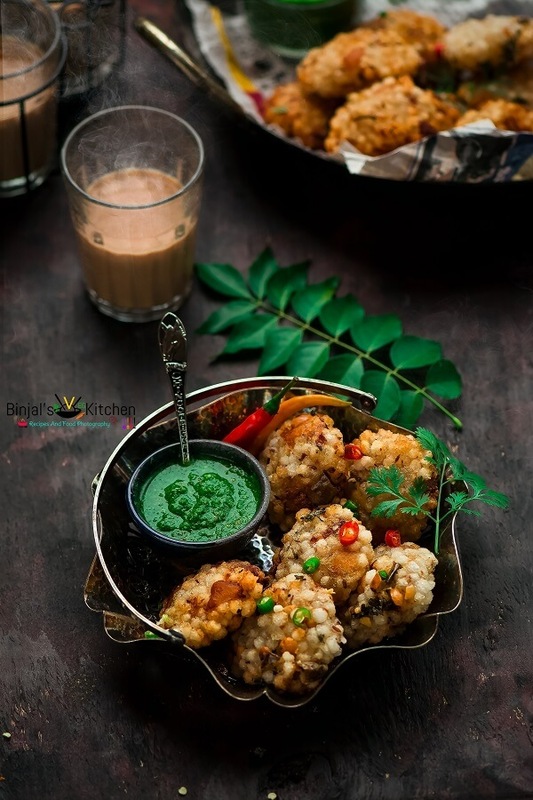 A soaked sabudana or sago mixed with select spices, crushed peanuts, boiled potatoes and shaped into vadas and then fried till the outside is crispy, crunchy while the inside remains soft and mushy. Sabuda or Sago also called Tapioca. It is one of the best food while fasting as it is a rich source of dietary fiber. These include a very low level of saturated fat, cholesterol, and sodium. It is also source of good cholesterol, and protein. Furthermore, Sabuda contains members of the vitamin B-complex, including pantothenic acid, folate, and B6, as well as iron, manganese, calcium, copper, and selenium. 1. Wash and soak the sabudana in enough water around 3-4 hours, then drain over the strainer or colander to remove the excess water. 2. Take a mixing bowl and mash the boiled and peeled potatoes in it. 3. Add the soaked sabudana, crushed peanuts, green chilies, cumin, ginger, lemon juice, salt and chopped coriander leaves. 4. Mix all the ingredients properly and make a stiff dough or mixture and keep aside. 5. Heat the oil in a deep frying pan. While oil is heating enough make tikkis or patties or vadas. 6. Now take the prepared mixture. 7. Apply few drops of oil on your hand palm, so mixture won’t stick to the hand. 8. Take small-small portion from the prepared mixture and make patties or tikkis or vadas and keep aside. 9. Once the oil hot enough drop the 2-3 tikkis into the oil, fry it for 1 mins then flip to another side and fry it again till both sides become golden brown. 10. Remove fried vadas using a slotted spoon on paper towel. Use same method for rest of the vadas. 11. 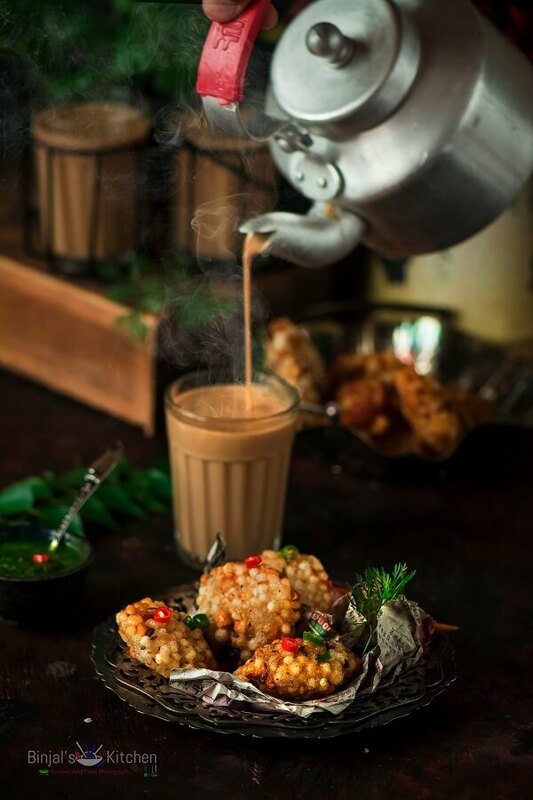 Now Sabudana Vadas are ready, serve with green chutney along with hot masala chai and enjoy the treat. • You can soak the sabudana overnight or 6-7 hr for the best result. Perfect soaked sabudanas are depend on quality too, so soaking time is matters. • You can adjust the spice level as per your taste. • If sabudana vada mixture is so soft, add some flour like Rajgira or Arrowroot to make stiff mixture. • Fry vadas always in hot oil, otherwise mixture can spoil into the oil and it will be mess. Sabudana Vada also called 'Sago Vada'. Sabudana Vada is a traditional deep fried snack from Maharashtra, India. Sabudana Vada is often served with spicy green chutney and along with hot chai. In other parts of the country, Sabudana Vadas are the best option to have when fasting. Therefore, this filling and nutritious snack is served usually during religious festivals and during fast/vrat/upvas especially during Navratri vrat. 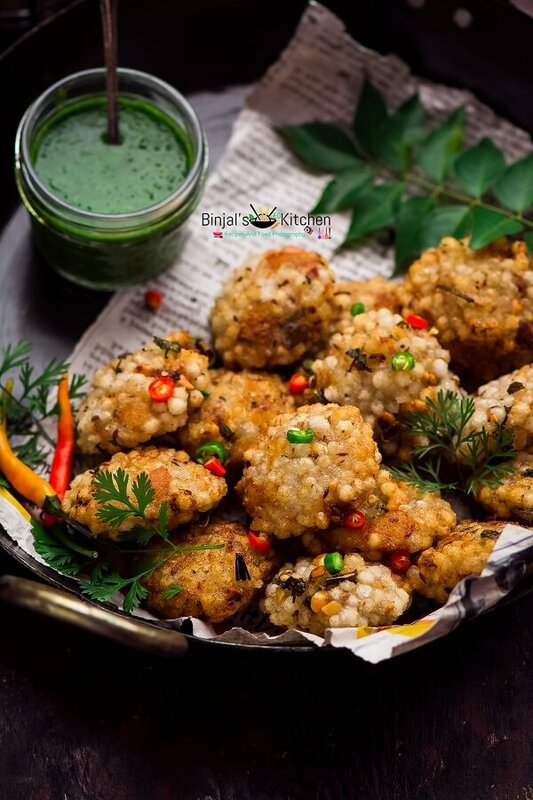 A soaked sabudana or sago mixed with select spices, crushed peanuts, boiled potatoes and shaped into vadas and then fried till the outside is crispy, crunchy while the inside remains soft and mushy. Wash and soak the sabudana in enough water around 3-4 hours, then drain over the strainer or colander to remove the excess water. Take a mixing bowl and mash the boiled and peeled potatoes in it. Add the soaked sabudana, crushed peanuts, green chilies, cumin, ginger, lemon juice, salt and chopped coriander leaves. Mix all the ingredients properly and make a stiff dough or mixture and keep aside. Heat the oil in a deep frying pan. While oil is heating enough make tikkis or patties or vadas. Now take the prepared mixture. Apply few drops of oil on your hand palm, so mixture won’t stick to the hand. Take small-small portion from the prepared mixture and make patties or tikkis or vadas and keep aside. Once the oil hot enough drop the 2-3 tikkis into the oil, fry it for 1 mins then flip to another side and fry it again till both sides become golden brown. Remove fried vadas using a slotted spoon on paper towel. Use same method for rest of the vadas. Now Sabudana Vadas are ready, serve with green chutney along with hot masala chai and enjoy the treat. Love that Sabuda is nutrient rich. 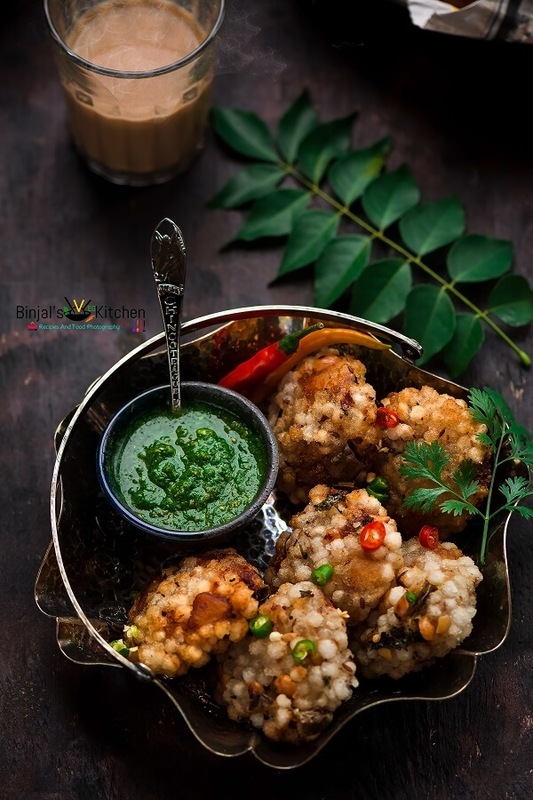 The colour of the chutney is so deep green, gives the whole dish a special character.